The George Tavern is under threat from property developers! This historic East London music venue and pub which is over 600 years old has hosted concerts and events for the likes of Nick Cave, Plan B, John Cooper Clarke, Babyshambles, and even Sir Roger Penrose. The adjoining 60s nightclub Stepneys was mentioned by the Rolling Stones in ‘Play with Fire’, countless concerts and parties took place over the years in a building which was famous for its illuminated dance floor. The venue has also hosted photo shoots for Kate Moss, Georgia Jagger, Justin Timberlake, Grimes, Amy Winehouse and Grace Jones. Upstairs the building was featured in Plan B’s movie ‘Ill Manors’ and Nick Cave’s debut video for his project Grinderman was filmed on site. As well as a regular new music nights, classical music concerts, pop-up art exhibitions, vintage jumble sales, film, poetry and spoken word gigs are also put on at a venue which embraces all aspects of the arts and supports the local and artistic communities. The Grade II listed pub and venue on Commercial Road, Stepney, London is under threat from developers who have purchased the adjoining site. They have submitted a number of different plans to build luxury apartments next to the pub. If the flats are built, the venue will most probably be forced to stop live music events – its bread and butter. If the George Tavern is forced to close it will be a huge loss to the local and artistic communities of East London and the hundreds of acts who play the venue each year. We cannot let this happen. 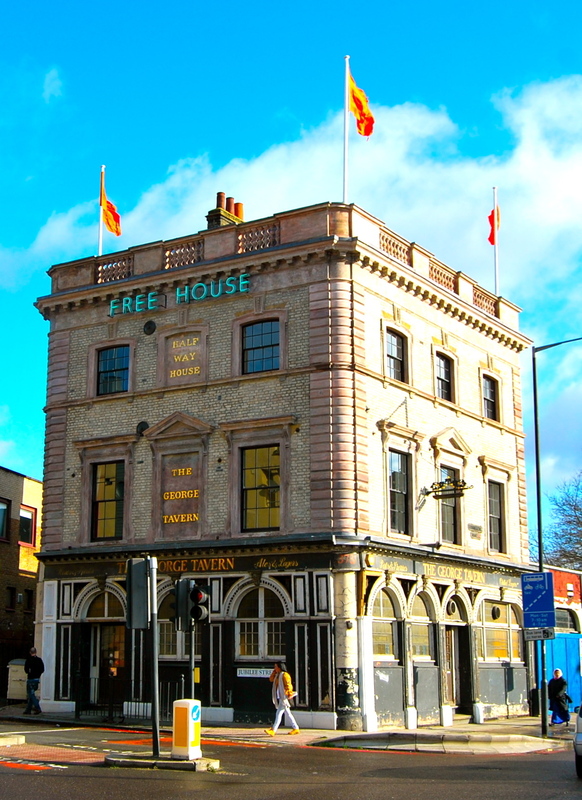 Please sign the petition now asking the Planning Inspectorate to uphold the original planning decision by Tower Hamlets council to refuse development on the site adjacent to The George Tavern, Commercial Road, Stepney, London.